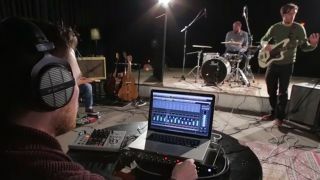 Welcome to a new 10-part video series from MusicRadar and Steinberg! In 'How To Record Your Band' we'll be giving you all the tips and inspiration you need to nail the perfect recording and turn your practice sessions into release-ready music. We'll set the scene with the perfect set up, before showing you how to record guitars, drums, bass, vocals and more. There's tips on how to prepare, how to manage your session, get the best from your bandmates, correct mistakes, pull off a flawless overdub and then mix and master the perfect track. So don't waste money on expensive studios. With your laptop, an easy-to-use audio interface and the latest digital audio workstation software you can get pro results fast. And then tweak even the most... um... 'ambitious' band to perfection. We're here to show how you how and you can start right now with a FREE trial version of the mighty Cubase 8. Each episode comes complete with tips from the experts and a video that shows you how the magic happens so learning from the pros couldn't be simpler. And it all starts here, with the first THREE episodes of the series tackling preparation, set-up and recording drums with lots more to come. We'll be continuing the series every Friday so be sure to check back each week to get the latest. Let's go make music.